Well if this outfit doesn't scream "I'm ready for Fall", nothing else ever will! 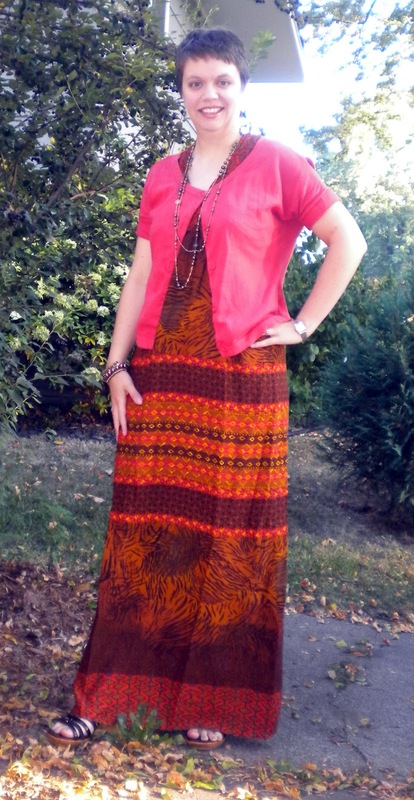 I bought this dress from the ModCloth sale and picked it out because even though it is a sundress, I felt the colors were perfect for Fall. Add a sweater and we're good to go. Another awesome thing about this dress? It has a built in bra. Oh how I love that! Picture taking continues to be a bit of a challenge these days. It may be time to take it inside. We'll see. But anyway, hard to believe it's the first week of September. Labor Day is over. Kids are back in school. The days are already getting shorter. There are even some leaves on the ground here already! I love it all - Fall is my favorite season - but there is a melancholy type feeling about this time of year too. Especially after a great summer, it's a little sad to see it go. While getting ready for work yesterday morning, the Pants Monkey even said "I feel a little down today and I don't know why." I said I was sure it was the end of summer letdown. Fortunately, we have many fun things to look forward to coming up still, so I don't think we'll be mourning summer's passing for long. How about all of you - are you sad summer is over or are you ready to embrace Autumn? Lovely. And seasonal. What I like more than any season is the CHANGE of season. The excuse to shift in the clothes we wear, to experience new weather, to get out of the rut we naturally fall into. Plus, I get to see you wear new clothes! Such a pretty dress. Love bright reds in the fall. I love that dress! I had a good summer, but I'm ready for fall as that is my favorite time of the year! I agree the colors in the dress remind me of fall! Remember summer isn't over just yet! You look lovely in that maxi! great colours:)We didn't have a great summer weather wise, so I am looking forward to styling some new pieces for Fall! Autumn! I love it! Bring it on. This is a LOVELY combination of colors on you-I can definitely see this dress in multiple seasons! I am sad that summer is over only because I feel it went too quickly...but boy am I excited for fall fashion! My favorite thing to do is layer with scarves and jackets and boots...ahhh I can't wait for cooler weather! I guess it's a good thing I live in the Midwest because we sure get enough of it! Ooooooh that dress is sunset in dress form! Wow I love the colours in this dress! Oh goodness, I love that maxi dress. You are right that the colors are perfect for autumn. And adding the cardigan over the top makes you look ready for cooler temperatures. I can't wait for my Modcloth sale finds to get here now! Glad that you snagged that dress - it's perfect! i'm with you...things do seem a bit sad. maybe it's because i'm missing my 3-day weekends! i love this dress and you're right, it will transition well into fall! What a great fall dress! I'm going to miss the warmth of summer, but I do love being back to work! Fall is HH's favorite season, it brings out his latent nature lover! What a great dress you chose for making the transition. The colors are perfect! Ooooh what a gorgeous maxi dress! The colors are perfect for fall, and look awesome with the pink cardi. Excellent score. I am so ready for summer and hot weather to be over. I want it to cool off. And possibly stop looking like the Apocalypse is going to fall out of the sky. It's summer gloomy with rainy - sun-rain-sun. The clouds blow through so fast they tumble birds around. Oh I love fall too, my favorite season! Michigan had record heat this summer, and I am not a fan of the heat, so I am more than happy to welcome cooler weather! This dress is perfect for fall! You can wear it well into November with tights under it too!